Italy's dramatic rocky mountains, the Dolomites, offer some of the best mountain scenery in Europe. Between these jagged, towering groups of mountains are gentle grassy meadows filled with wildflowers and Bavarian alpine towns. The bold light, gray cliffs and spires, flecked with snow over green meadows under a blue sky, offer a powerful, unique, and memorable experience. Cycling mostly downhill to reach Venice, you will enjoy the organized bike trails or quiet country roads with little traffic. 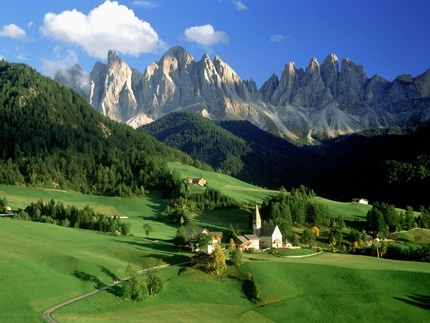 Combine the Dolomites with the green vineyards of Prosecco wines and you have a wonderful combination. Discover the village of Valdobbiadene en route, its winding streets lined with rickety old houses perched along a steep hillside. Appealingly, most of the cantines in the region remain family-owned; many of the tasting rooms remain ad hoc operations where visitors rap on a wooden door to call the winemaker from his work for a quick pouring. Then leaving the best for last, you will reach romantic Venice. This cycling tour has something for everyone, great food, fabulous wines, mountains, art, cuture and history.